pen and inks on technical paper. Roman Verostko (left) and Jean Pierre Hebert (right), 2011, Santa Barbara. In 1995, Jean-Pierre suggested that we adapt the term algorist for our identity. He also wrote the algorithm defining "algorist" that is now viewed as an "algorist manifesto" . I met other artists following the same path who were interested in an identity for their algorithmic art practice. It was Jean Pierre Hebert (JPH) who suggested we adopt the term "algorist" and he also wrote the algorithm for an algorist. This algorithm is now viewed as the "algorist manifesto" and it was JPH who led discussions and correspondence in establishing its usage. 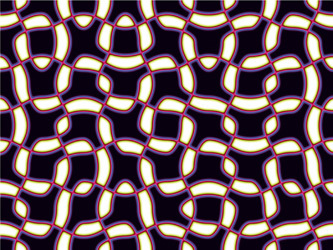 While the practice of algorithmic art reaches back to pre-historic basket-weaving and tool-making the implementation with computing power provided new "form-generating" capabilities. Although adapted in 1995 the term applies to work by colleagues that date back to the 1960's and even earlier. With the rise of ubiquitous computing algorithmic art now ranges from games and interfaces with biological life to experiments with the evolution of form and social consciousness. The term algorithm is an alternative spelling for the term "algorism". Thus a person who works with algorisms (or algorithms) is an algorist. Traditionally the term algorist is associated with mathematicians. An algorithm refers primarily to the step by step mathematical procedure for carrying out a specific calculating task (see note 1). With the advent of computers we find ourselves writing procedures that reach beyond solving mathematical problems. The detailed instruction directing a drawing machine on how to draw a visual form is also an algorithm. Today, more broadly, a composer's score for musical form and a choreographer's notations for dance may also be viewed as algorithms. Such notations, similar to computer software formats, are detailed procedures for carrying out a task. From this perspective we could also view the recipe for baking a cake as an algorithm. Algorithmic art may be found throughout history, from prehistoric basket weaving to geometric and conceptual art in the 20th Century. However, the advent of computers provide us with form-generating leverage that, to the best of my knowledge, has no precedent in the history of art. It is in this sense that algorist artists of the late 20th Century pioneered procedures that have come to permeate the visual and sound arts in the 21st Century. 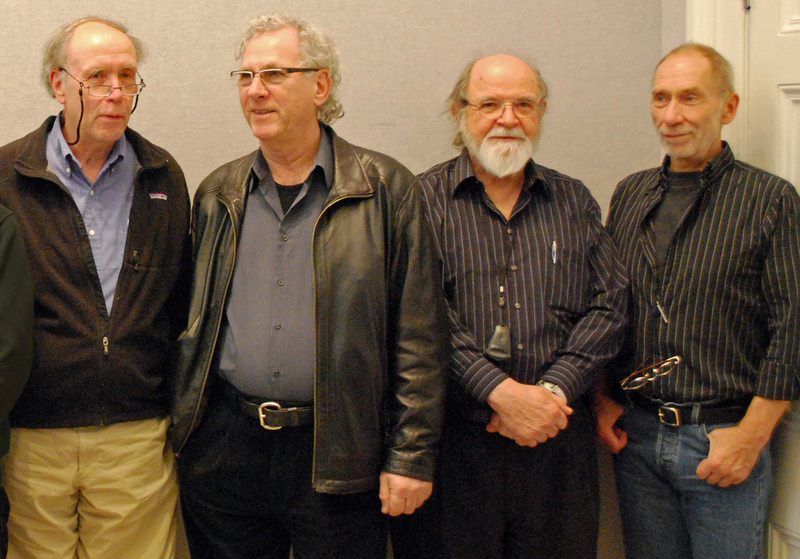 Left to Right: Mark Wilson, Manfred Mohr, Roman Verostko & Frieder Nake: Four algorist pioneers at the Victoria & Albert, Museum, Jan 5, 2010. Photo by Douglas Dodds in the context of a V & A display of their work. In the latter half of the 20th Century, with the growth in information science and digital technologies the use of algorithmic procedure spread far beyond the dreams of its earliest practitioners. We have, among the living in 2012, a number of algorists whose vision and work with programming pointed the way that permeates the world of art today. Pictured above, in a single frame, are four algorists who were present in the context of a display of digital pioneer works at the Victoria & Albert in London, 2010. 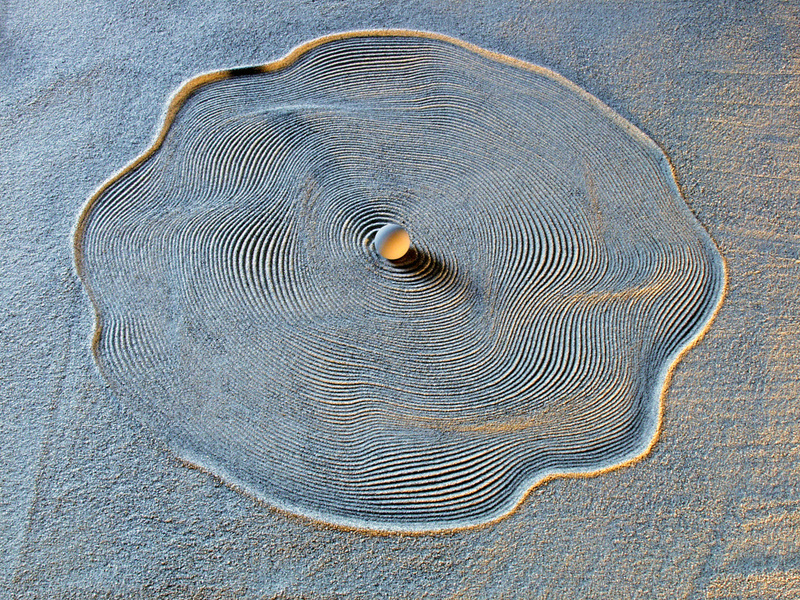 A retrospective of the pioneer work of Hiroshi Kawano, pictured above, was presented at the ZKM in Karlsruhe, Germany, in 2011-12 before he died. While not present for the photo above, celebrated pioneers like Herbert Franke, Vera Molnar, Charles Csuri, and Harold Cohen (shown below), were also represented in the Digital Pioneers V&A display (Note 8.) . Other important contributors to the pioneers showing, not pictured here, included George Nees and Edward Zajec. Historic Notes: Writing the score for drawing. In the last quarter of the 20th Century I was one of a like minded group of artists who undertook to write instructions for executing our art. In the 1970's & 80's "Computer art" was the term generally applied to all art associated with computers. Some of us had been working with algorithmic procedure for about a quarter century before our 1995 declaration as "algorists". The 1995 manifesto of the "algorists" was not a declaration of something new; rather, it was giving identity to an artistic practice that had already brought radical change and would continue to change the way we would create art in the 21st Century. 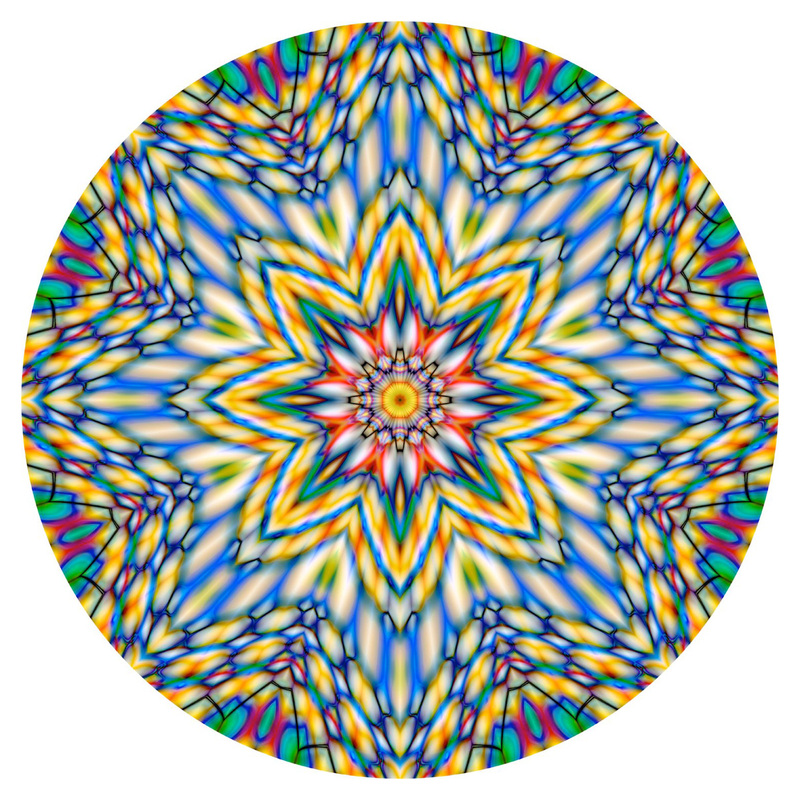 The algorist adaptation provided a name for artists who practiced algorithmic art. This practice also had a valuable presence in sculpture and music. 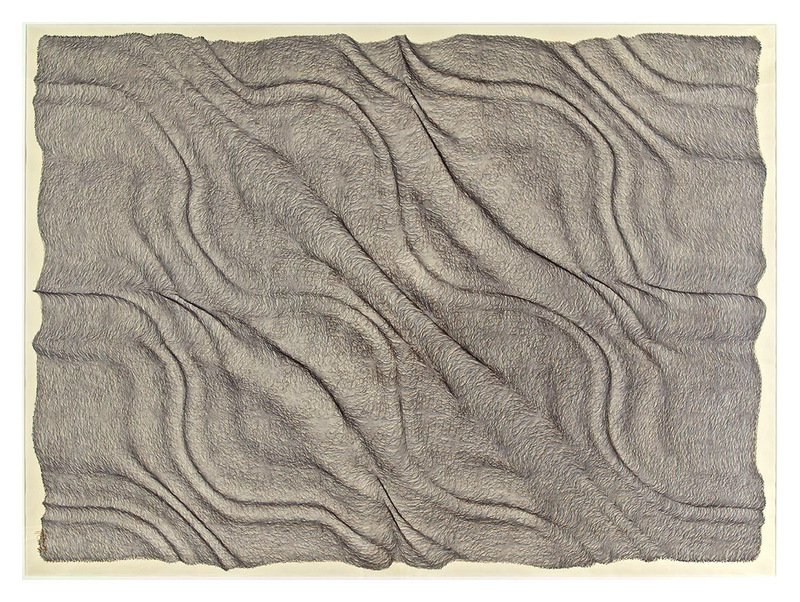 Helaman Ferguson would be a sculptor whose algorithmic art celebrated an aesthetic rooted in mathematics. His "Four Canoes", shown below, is an excellent example with links to information on the procedure for achieving the form of the tori, the pedestal, and the platform. "Four Canoes", 1997, University of St Thomas Science and Engineering Center, St. Paul, MN, USA. 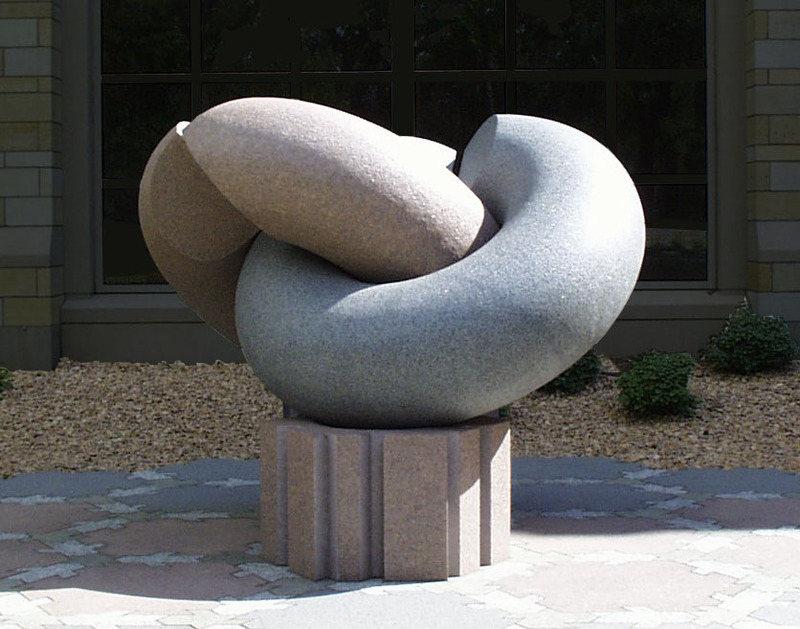 This impressive algorithmic presence features two interlocked six foot granite tori mounted on a platform created with hexagonal tiling. Yet algorithmic art should not be confused with the practice of mathematics. The process of writing the score for a drawing requires poetic engagement similar to that required for composing the score for music. 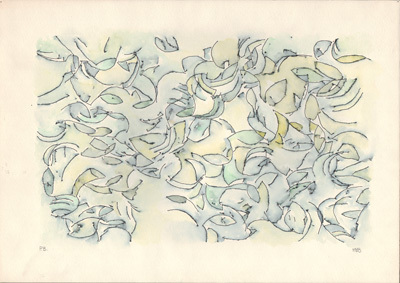 Algorithmic drawings, like my "Green Cloud" shown below, evolved from my passion, as a painter, for the marriage of spontaneous brushwork and studied arrangement. With elementary programming abilities I explored the same goals I had set for myself as a painter. 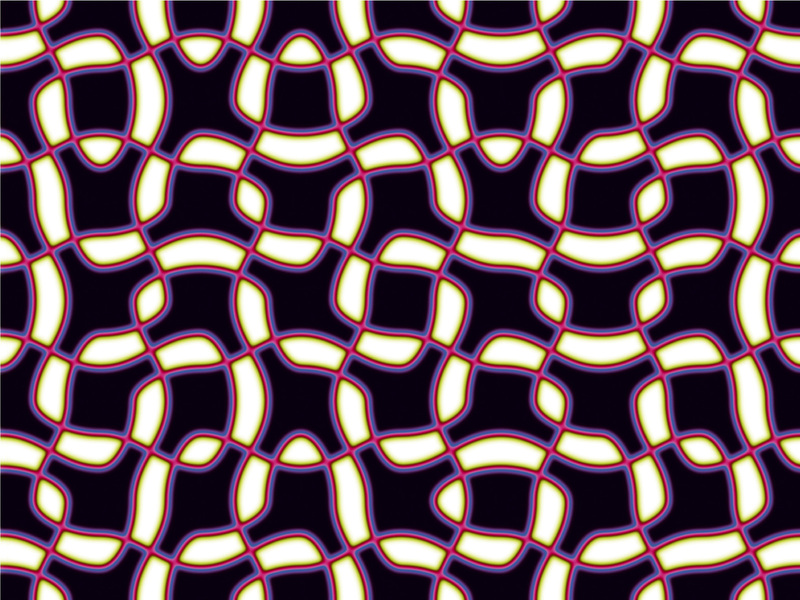 Clearly programming and mathematics do not create art. Programming is a tool that serves the vision and passion of the artist who creates the procedure. *Green Cloud (the drawing)" by Roman Verostko. Pen & ink plotter drawing. Drawing process presented as a Three Story Drawing Machine, June 2011 at the Minneapolis College of Art & Design (MCAD). Three Story Drawing Machine, north wall, MCAD, Northern Spark, "White Night", ca. 4:30 AM, June 5, 2011, nearing the end of an 8 hour, all night drawing session. Before looking back let me note that several pioneer algorists have carried their form explorations well into the 21st Century. Of these Manfred Mohr and Harold Cohen stand out as two of those master pioneers who were the first to achieve mature algorithmic styles. Manfred's "Klangfarben" series demonstrates the power of algorithmic procedure in the hands of a master. Manfred has labored for over 40 years creating visual tension fields as an art of pure visual form. In this series we experience algorithmic form generation in real time. 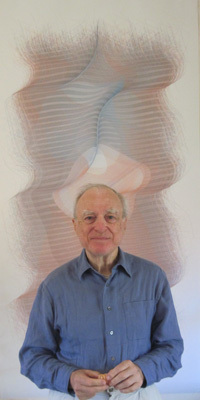 "Aaron", a personification of Harold Cohen's software, represents over 30 years of work on creating an intelligent artist. Aaron's drawings and paintings, grew from Harold's earlier experience as a painter. Consequently "Aaron's" code appears to yield a mysterious relationship to Harold as the artist-painter in his earlier years. Historically how did we get here? In the earlier days of computing there were no software tools for artists. 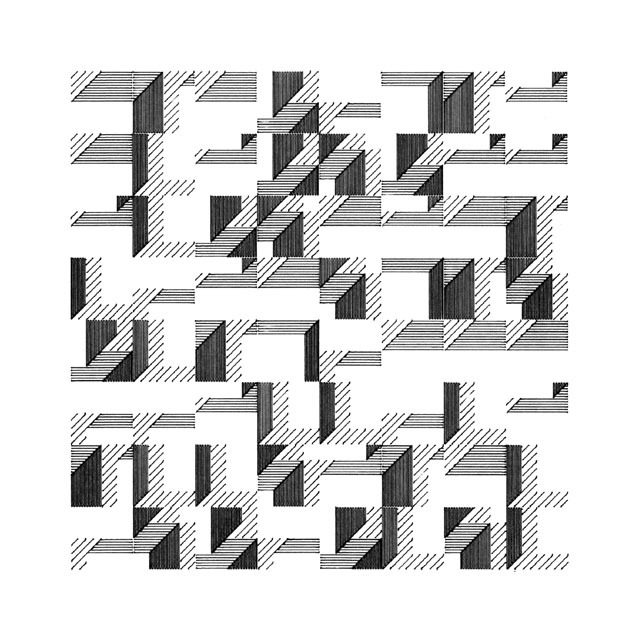 Frieder Nake told me how he came upon the task of writing software for a drawing machine at the University of Stuttgart in 1963. The company did not supply software with the machine and he was assigned the task. 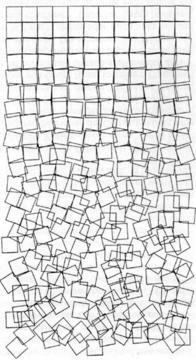 During the 1960's several artists like Manfred Mohr and Hiroshi Kawano saw the "form-generating" power of computers as an opportunity for art. 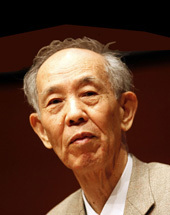 Hiroshi Kawano had hoped to gain insight into the logic underlying our creative process. Software and technical procedures for visualization grew hand in hand with hardware. Artists engaging new computing and visualizing technologies had to either collaborate with engineers for programming their ideas or else create their own programs (algorithms). 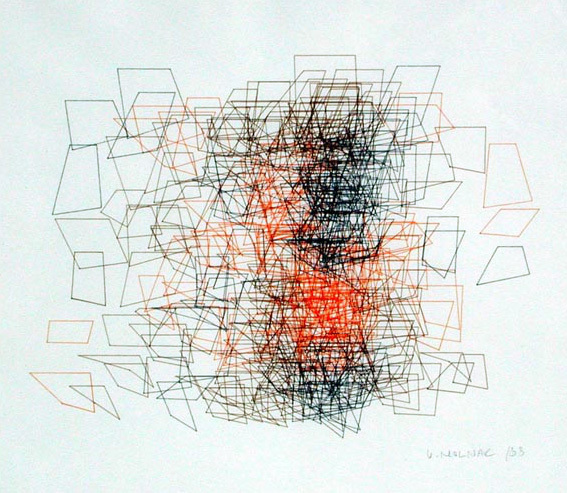 Early plotter drawing in a series achieved with algorithmic procedures that included rules he viewed as "aesthetical-filters"
P702F, Endurachrome, 2000. canvas, 76cm x 100cm. This work belongs to the artist's space/color work phase that followed about 30 years of his work in monochrome. Mohr's work with coded procedure, steadfast for over a period of 43 years, demonstrates the power of algorithmic procedure. Yet the term algorist was not introduced until 26 years after his first algorithmic work. 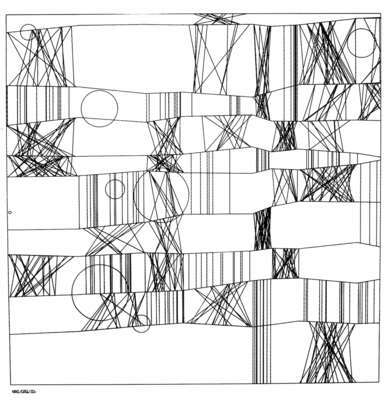 Those artists who first experimented with coded artistic procedures with computers included Hiroshi Kawano, Herbert Frank, Manfred Mohr, Frieder Nake, Georg Nees, Vera Molnar, and Edward Zajec. Artists who used computers in the art-making process were often called "computer artists". 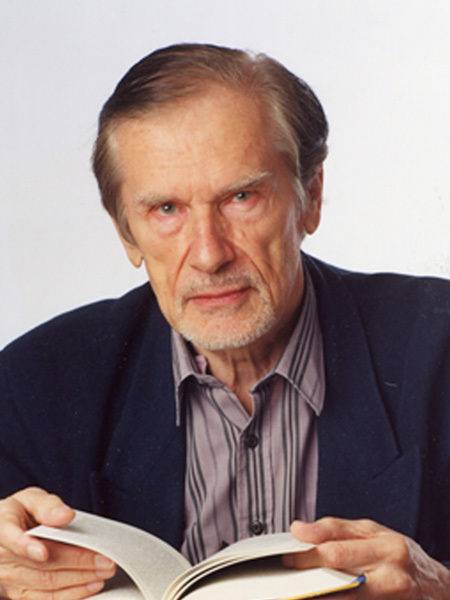 Frieder Nake, a pioneer algorist, has, in recent years, served as the chief investigator documenting first generation "Digital Art" at the University of Bremen in Germany. 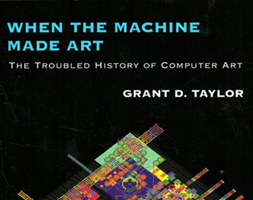 This "CompArt" data bank provides an excellent source for perusing the breadth and depth of early algorithmic art. 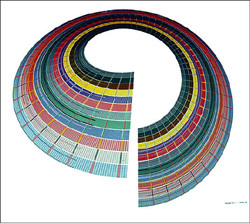 From the 1970's up to the early 1990's this work was generally referred to as "computer art", a term that became the umbrella for any kind of art associated with computers. Artificial Mondrian, 1967. Rendered in Gouache on paper. The model for this work was coded in Fortran with a HITACHI 5020 in Tokyo. ZKM Collection, Karlsruhe. 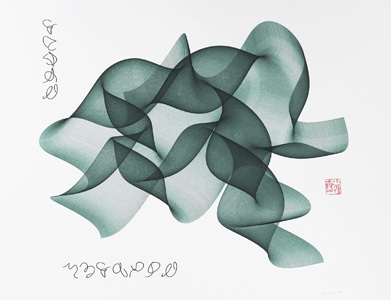 Hiroshi Kawano (1925-2012) began exploring visual form with computers in order "to understand the logic of the creative process in human art"
A.Michael Noll, USA, Computer composition with lines, 1964. This drawing was meant to mime procedures similar to those employed by Mondrian for his "Composition with lines". Hardware: IBM 7094 computer and a General Dynamics SC-4020 microfilm plotter. Artwork Type: serigraphic print edition after plotter drawing. Museum of Contemporary Art, Zagreb, V&A Collection, London. 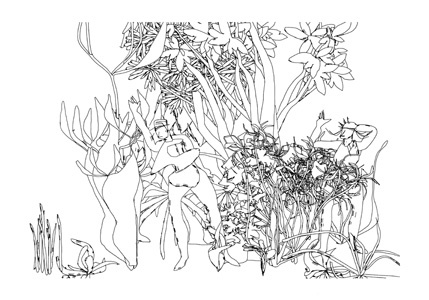 Aaron's Garden, pen and ink drawing plotted by Aaron in 1989. 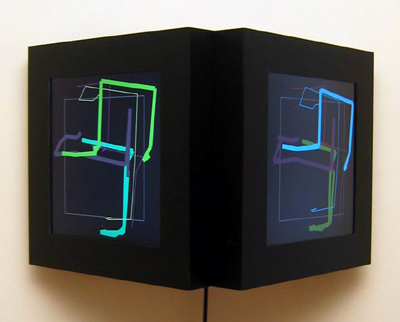 "Aaron" is a "personal expert system" that Harold Cohen developed for generating art. 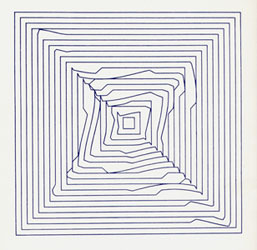 "Aaron" consists of Harold's coded program of generative drawing procedures and a flat bed pen plotter. Aaron's drawings of two figures in a garden recall the tradition of representing Adam and Eve in the Garden of Eden. relationship between order and disorder, and the effects of change." 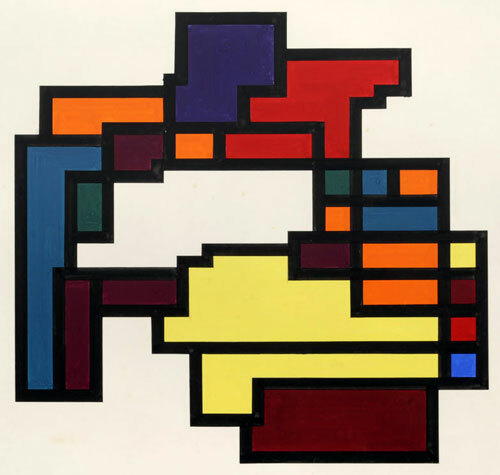 By the mid to later 1980's a fair number of artists using original algorithms had achieved distinctive algorithmic styles, each with a body of mature work. Working independently of each other, we found, when we did meet, that we shared many similar experiences. Furthermore we could be helpful to each other by establishing our unique identity. 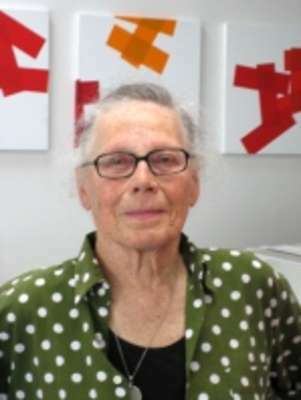 While I had little contact with Manfred Mohr, Frieder Nake, and Vera Molnar I was aware of their work and shared some of the same exhibiting venues. 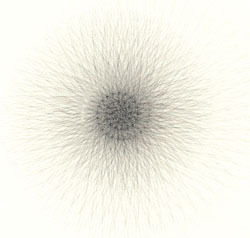 Artist's coded procedure from 100 views of a megagon. print 8" by 8" image on paper, Somerset Book, measuring 12.75" by 19". Untitled algorithmic pen plotter drawing tinted with watercolor. Stephen Bell, 1977-79. 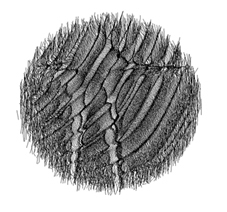 Detail of one of a drawing created with his ranstack algorithm. The ranstak programs were the first programs developed by Bell as a postgraduate student at the Slade School of Art in 1977-79 in the Department of Experimental & Electronic Art. In an informal casual meeting sometime shortly after the panel, Jean Pierre, Ken Musgrave and I briefly discussed forming an informal group of artists who shared similar interests in algorithmic art. 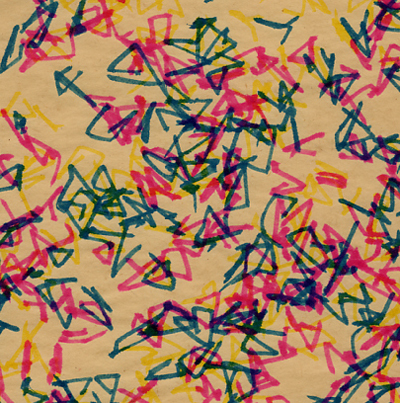 We were especially interested in establishing a name for those of us who practiced algorithmic art. I have always felt that the title of our panel, the milieu of that conference, the vitality of the panel members and our shared common interests, was the springboard for establishing our identity as "algorists". So artists who create an object of art with a process that includes their own algorithms are identified as algorists. In the late 1990's Jean Pierre and I continued to exchanged ideas and I usually visited with him when SIGGRAPH met in LA. After the turn of the Century I wrote a review of his work that had never been published. This review followed one occasion when my wife and I enjoyed experiencing, along with Claire and Jean Pierre, a late evening watching his Sisyphus slowly tracing pathways in the sand. Recently I located the article along with our earlier 1995 correspondence. I am posting my review here for colleagues who may not be aware of how much we shared in the 1990's. See: Jean-Pierre Master Algorist. see: www.brianevans.net © Brian Evans Ken Musgrave, USA, Inkjet on rag paper . Slickrock III, 11.5" by 20.5"
Pen & ink. 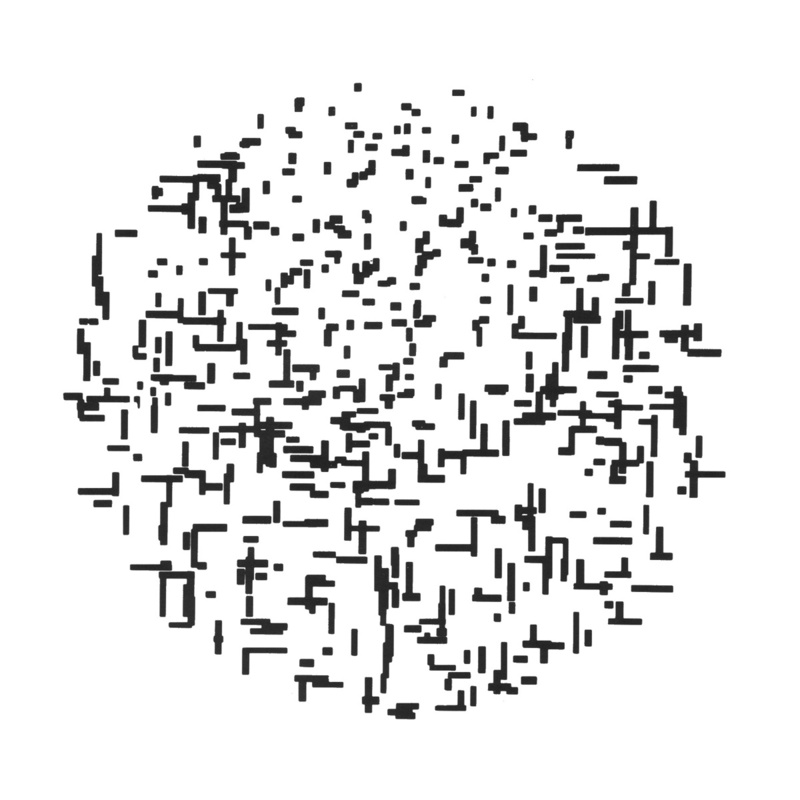 algorithmic pen plotted drawing. As artists employing algorithmic procedures the term algorist fit our interests well. In general we are fairly agreed that algorists are artists who include original algorithmic procedures in the course of creating their work. The use of algorithms in and of itself does not constitute algorist work. It is the inclusion of one's own algorithms that makes the difference. As algorists with or without computers, we all employ algorithms created by colleagues and predecessors. The algorithms for geometry and perspective come to mind. We depend on algorithms others have created for everything from the circuit logic and operating system of our computers to the computer languages and the editors that we use. 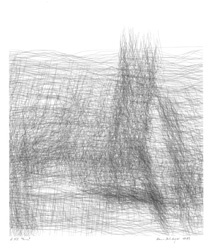 The algorist goes one step further by introducing original algorithms for generating "art". The jewel of algorist art lies in the artist's own "form-generating algorithms", the artist's unique procedures for creating the form. From this perspective Mozart's score for a Sonata, the architect's plan for the building, and Hans Dehlinger's code for a drawing are all "form-generating" algorithms. Algorithms have been used variously in the arts for centuries. And the procedures were carried out manually without the use of machines. Clearly an algorist may also practice her art without the use of computers. 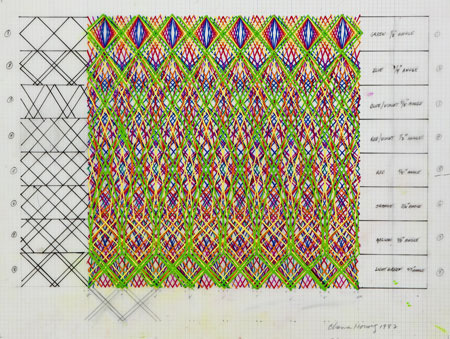 That has been the case in the work of Channa Horwitz (1932-2013) whose algorist work was executed entirely by hand. Her algorithms are profoundly informed by progressions and number. 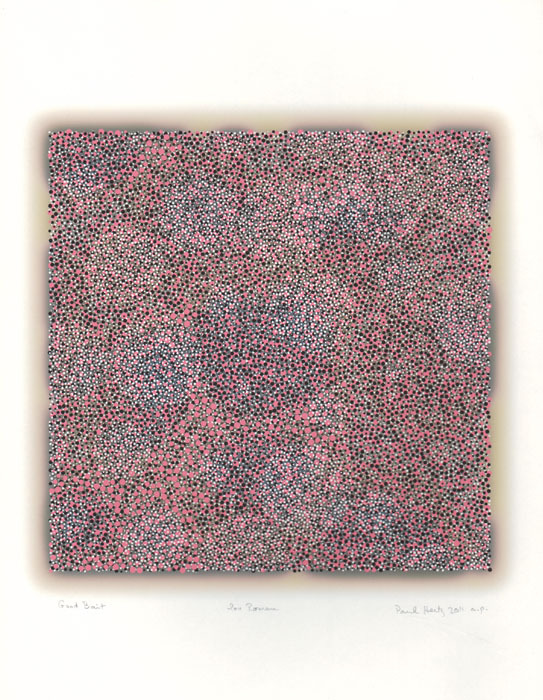 Channa is one of the four algorists in the first show that Jean Pierre Hebert curated at the Kavli Institute for Theoretical Physics in Santa Barbara, a show noted at the end of this essay. Finally, one aspect of the algorist definition remains open to interpretation. An algorist, by definition, creates "art". The definition does not identify what constitutes "art". One might employ original algorithms and create work that one person may experience as art while another may not experience it as art. For example a mathematician may use original algorithms in creating a scientific visualization that some may view as "art". Yet the visualization may not fit another's conception of "art". While we may have our various preferences the definition cannot and, in my view, should not attempt to define what kind of work belongs in the world of the art we choose to cultivate. This essay can only suggest the breadth of this practice. For example let me point to the important work of Paul Brown, an algorist whose writings and newsletters kept us well informed for years, even before we had the web. Dividing his living between London and Australia he identifies with those circles in the UK involved with the theory and practice of generative art. This includes Ernest Edmonds whom I first met in 1996 at his annual conference on "Creativity and Cognition" at Loughborough. As an algorist, deeply involved with the nature and practice of generative art, his writing, teaching and art work has been felt widely by colleagues and students. Algorists who had been active since the 1970's had no common identity and therefore no web site or historical reference to their work specifically. 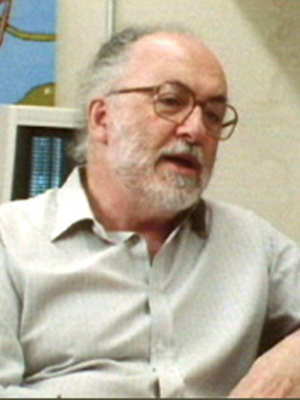 In 1996 J.P. Hebert introduced several pages dedicated to the algorists. These pages spelled out essential features of "algorist" art, historical precedents, and links to related topics and issues. These initial pages identified an informal group of active algorists including Yoshiyuke Abbe, Harold Cohen, Charles Csuri, Hans Dehlinger, Helaman Ferguson, Manfred Mohr, Vera Molnar, Mark Wilson, and others. 36 x 48 inches (91 x 121 cm. ), pen & ink on paper. 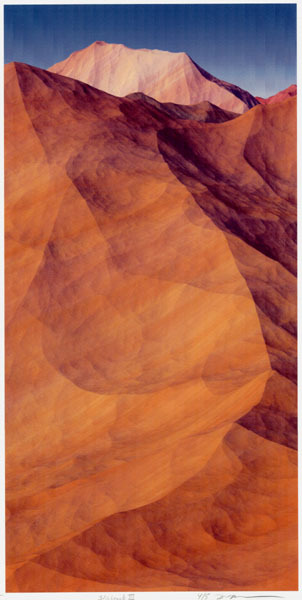 Evolution #5 of 10, digital print, 6.7" by 6.7"
Hahnemuhle paper measuring 11.7" by 16.5" . 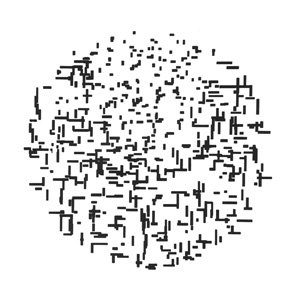 Vlatko Čerić is one of many algorists, who employ generative procedures and demonstrate the breadth and depth of algorist artistic achievement. 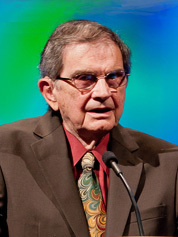 Paul Hertz, 2011. Chicago, USA. 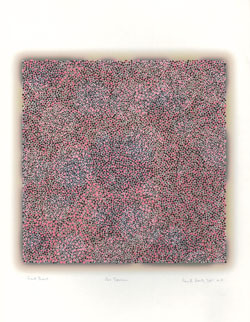 Good Bait, Algorithmic digital print, 8.5" by 11"
Many first generation algorists worked with pen plotters as their first graphic interface. Some shared a common history that grew out of conceptual art and an interest in the emerging information processing technologies of the 1960's. Put in perspective the work of first generation algorists marked a turning point in the history of western culture. Algorithmic procedures have changed everything from the way we create film and music to the way we run wall street, the military and our communications systems. 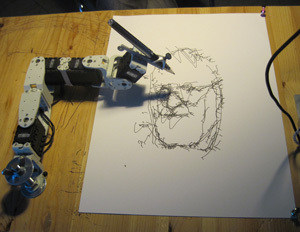 "Paul", a robotic arm drawing my portrait on Sept 28, 2011, at the University of London, Goldsmiths. This robotic arm, "Paul", is the work of Patrick Tresset in "The Aikon Project". 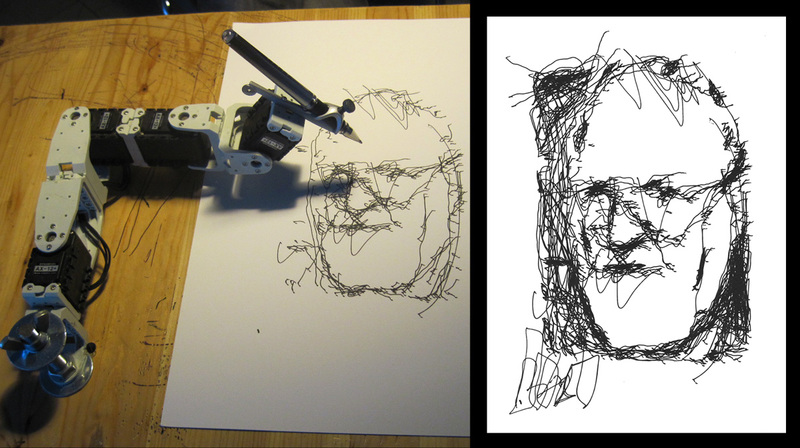 His research uses computational and robotic technologies to explore drawing activity with a focus on face sketching. While algorists themselves presented their own shows and participated in group shows it was Jean Pierre Hebert who curated the first exhibition formally identified as "algorist". This exhibition was presented at the Kavli Institute for Theoretical Physics in 2006 (University of California at Santa Barbara). The catalogue for this show provides an excellent introduction to the nature of algorithmic practice with specific examples of algorithmic drawings by four artists: The Algorists: four visual artists in the land of Newton". This picture was taken in 2005 in Channa Horwtiz' studio, Santa Monica CA., USA. In the years ahead we may expect, as the history is written, that the last quarter of the 20th Century will emerge as the heart of the algorithmic revolution that would profoundly impact world culture in the 21st Century. Thanks to the curatorial work of Grant Taylor and his years of research a well informed catalogue was published for a showing of four American algorists in the fall of 2013. His catalogue essay views the "American Algorists" as an important chapter in the history of American Art. The show, celebrating the 20th anniversary of the New York Digital Salon, opened first on August 30th at the Suzanne H. Arnold Art Gallery, Lebanon Valley College, Annville, PA. Later, on October 27, the New York showing opened at the Westside Gallery, School of Visual Arts in Manhattan. DOWNLOAD: The American Algorists: Linear Sublime. ALGORITHM & ALGORISM are equivalent terms in English. They descend from the name of the Arabian mathematician, Abū ʿAbdallāh Muḥammad ibn Mūsā, a native of Khwarasm, surnamed al-Khwārizmī (c. 780 – c. 850). He was a Persian mathematician, astronomer and geographer during the Abbasid Caliphate, a scholar in the House of Wisdom in Baghdad. It is believed that his surname, al-Khowarazmi is the source for the term algorism. Early usage appears variously as augrime, augryme, algorisme, algarism and variations with latinizing influence as in algorismus. In English the term algorism appears in 17th Century writing as algorithm . This modification from algorism to algorithm may have been mistakenly influenced by the Greek term for number that is ’arithmós (’αριθμός), the root for our English term arithmetic. In English the term algorithm is more commonly used today. So one who employs algorithms (algorisms) would be an algorist. ARS ELECTRONICA. 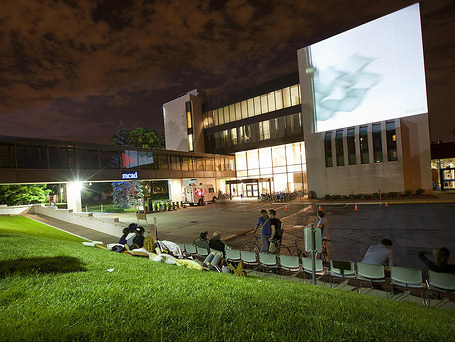 Founded in 1979 as a Festival for Arts ,Technology and Scociety, it has served as a premier center of the electronic arts with its exhibitions, publications and prestigious award, the Prix Ars Elecrtronica. Located in Linz, Austria the AQrs Electronia Center in cludes a Museum of the Future and the Ars Electronica Futurelab. I especially appreciated their well documented publications and the invitation to exhibit in "Code the Language of Our Time". To address algorithmic procedure in the arts I organized a small symposium at the Minneapolis College of Art and Design in 1991 (February 23/24). This symposium Art & Algorithm - Mind & Machine, included an audio visual show, "Images of the Unseen From the Worlds of Art & Science". The presentation of video, sound tracks and slides included the work of 23 artists and scientists from 6 countries. 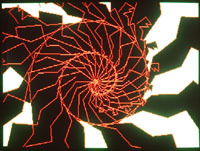 Courtesy of the artist for the 1991 symposium on Art & algorithm... .
Artists and scientists whose work was shown included: Stephen C.G.Bell (UK), Donna Cox (US), Charlotte Davies (Canada), Hans Dehlinger (Germany), Helamen Ferguson (US), Samia A. Halaby (US), Bruce Hamilton (US), Jean Pierre Hebert (US), Yoichiro Kawaguchi (Japan), William Latham (UK), Vera Molnar (France), Jim Otis (US), Clifford Pickover (US), Jeffrey Ventrella (US), Mark Wilson (US), Toshifumi Kawahara (Japan). Note 3. My paper on algorithmic art included examples of work by several algorists with a note pointing to the JPH work on display. Our works were shown on opposite walls in the same Sidney gallery and I was especially impressed with the new work JPH had sent. In another gallery Brian Evans had presented a very impressive show of algorithmic work that included sound and light works. The ISEA show traveled to Melbourne and the Hebert's large triptych was never returned. His triptych, as I recall now, was an outstanding work excelling anything I had ever seen in algorithmic pen and ink work. All efforts to recover the work have failed and I view this as a loss to the history of 20th Century algorist art. Note 4. The use of the term "algorist" to identify a specific group must be understood in the context of its use. Historically it applied to those who used algorithms for solving mathematical problems. 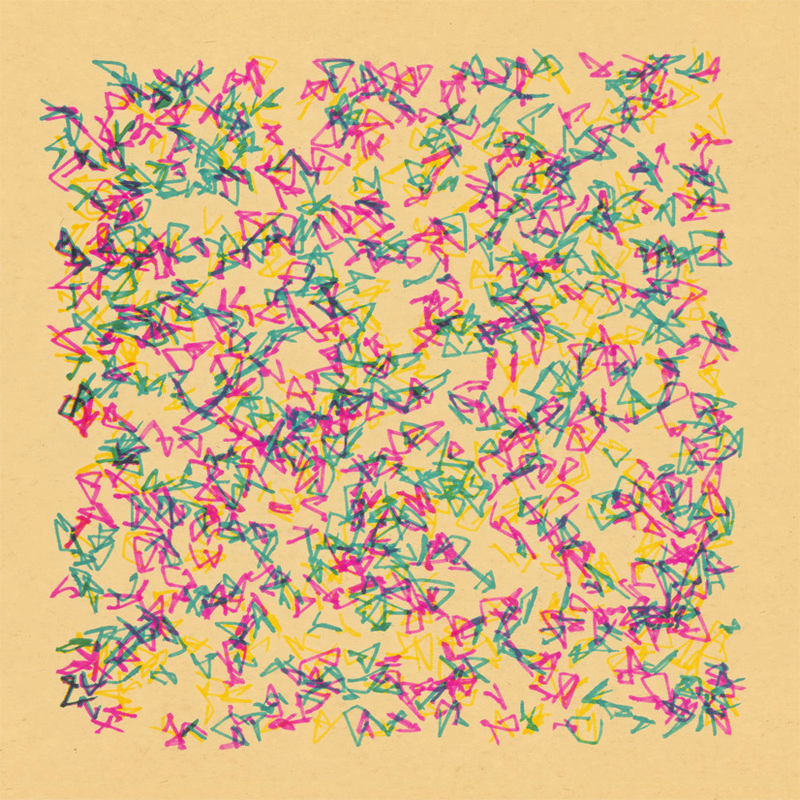 In the late 20th Century we used it to identify the growing number of artists who write algorithms in computer languages for implementing their art. The term itself has undergone interesting usage in the history of mathematics. In the late Middle Ages controversies arose between the "algorists" and "abacists". The algorists, having adapted algebra and Arabic numbering, found resistance among the abacists with their classical numbering system and Euclidean Geometry. So the "algorists" were mathematicians who embraced calculating procedures with the arabic numbering system. Patric Prince (Art Historian) poses with 3 algorists in San Diego, August, 2003. Patric Prince collected works by many early digital artists. Algorist art, in the most proper sense, belongs to our own unique time in history. We have, in the view of Peter Weibel, undergone an algorithmic revolution, a revolution that has transformed the worlds of commerce and politics as well as arts & culture. 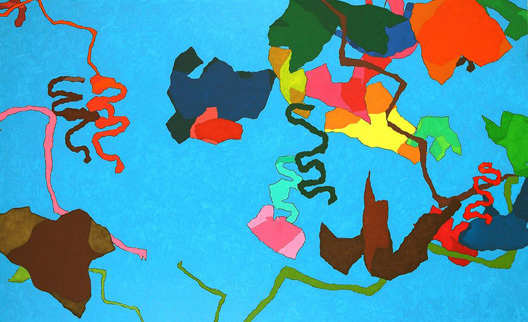 And the first generation of artist algorists were pioneers in applying procedures that are now changing world culture. Evan Brian presents this pseudo code excerpt (the first two bars) of Beethoven's Ode to Joy for his visualization. Note 7. See Frank Dietrich's account of this period: "Visual Intelligence: The First Decade of Computer Art (1965-1975)", in IEEE Computer Graphics and Applications, Vol.5, No.7, pp 34-35, July 1985, Reprinted in Leonardo Vol.19, No.2, pp.159-69, 1986. Note 9 Jean Pierre and I collaborated in initiating procedures and implementing the usage of the term algorist. I have had inquiries on usage of the term "founding member": I have used the term in reference to those of us who were involved with establishing the usage of the term "algorist". While the term "algorist" applies to all algorithmic artists this account is meant to clarify the "origins of the usage". This web site attempts to spell out the milieu from which the usage emerged. Note 10. My email files from that period are not complete. There could have been an earlier email from JP with the algorithm. Note 11 Loss of files, changes on web pages that were not archived and other circumstances make it difficult to reconstruct lists. .